I've been thinking for years these big cat sightings in the UK are all escaped or released exotic pets. I have seen one and so has my husband ..at different times. I thought I saw one in Bronte Country on the Moors. But I was young and I don't know if memory or imagination serves me. I saw one in Dorset. There have been a few big cats escaping from private zoos, but anyone who has lost a big cat or let it loose, which was kept illegally, obviously keep their mouths shut. If there were any in Bronte Country today, I would know, I covered every inch with the different packs, although there is enough sheep around here to feed several families of ABC's..
Thats just silly, we all know the big cats ate all the wallabies in Scotland.. I know there are wallabies in Whales, the amount of times I have looked out to that island when we stopped in Luss on our way to the Isle of Mull and the time there are little skivvies bounding around there? I can see why its up for debate. Thanks for the link. 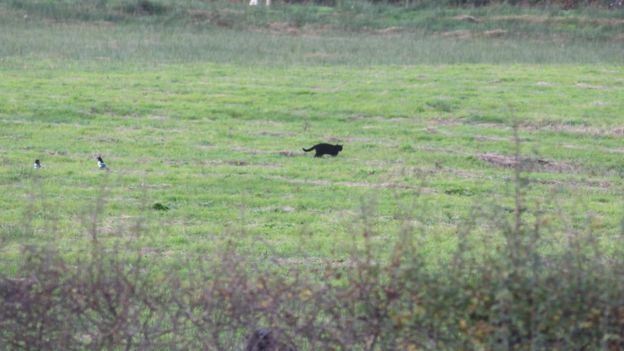 A big cat spotted by a number of residents in east Ayrshire is not a black panther, police have confirmed. So I have no doubt that big cats exist in places they're not supposed to but comeon people if you're using this picture to report a black panther, shouldnt you have also reported the freakishly large birds hanging out with him? Scotland has been invaded by giant man-eating magpies! Any photos?,probably a hallucination,were you sleep deprived?on medication?There's lots of reasons people see unusual things but they aren't real,not ever. Thats the exact reason people need to do their research before purchasing these animals because the only one that suffers in the end is the animal..Case in point; the python problem in Florida. That said I believe (ABC's) Alien Big Cats are more likely than any bigfoot out there...and probably the only reason that is you cannot buy bigfoot at a pet store! Let me make this one clear, i am not saying i saw ghosts or orbs or anything paranormal. It is a fact there have been wild cats let loose or have escaped. Looks like Tom has gone walkabouts again. Other than misidentification the ABCs have got to be escapes or released animals. I read somewhere that sightings have dropped since the law changes in the 70s which would make sense since it's now harder to keep those animals. I'll see if I can find a link to the article. I find it hard to believe you saw this "big cat" once, then you or your husband went back to the same area and saw it again without a camera to catch it more than once. Why do so many people in Scotland have big cats in the first plaace?!?
? Where did i say any of that? I saw one when on a train and my husband saw one when driving his lorry in Wales. Since the introduction of the Dangerous Wild Animals Act of 1976 and the changes in law on circuses keeping wild cats, sitings have been seen in many areas. It is not a secret or a mystery that owners let their exotic pets loose and some have escaped. We are not talking about anything paranornal here so please do not try to compare the two by using questions we would use when people claim to see anything paranormal...that is being ridiculous. these exotic cats do exists in our world and it is no secret people keep them as pets. So does the paranormal.I guarantee more people have seen paranormal things than escaped big cats,99% of the cat sightings are just big ferals as I suspect you and your husbands cat sightings were. I find it just as hard to believe what you claim to see as you to my claims.And who's "we"are you in a club or something. You are being very foolish. What are you not getting that there was a law change because people have exotic pets which include big cats. There are no laws about the paranormal...unless you want to include 'no trespassing' by those trapsing into cemetaries or old houses at night. Did you not read the links? Big cats have escaped or been let loose. I am a nature lover and have lived on the rivers and canals and in the countryside for many years, and know my wildlife and know the difference between a tom and a panther. I have even said on here when people post a picure claiming to have seen a big cat,, that it is not one.